Crude oil came under pressure during Monday's session after US sanctions on Iran began to kick in and after President Trump admitting that he is concerned about oil prices saying that he wants to go “a little bit slower” to avoid lifting prices. Meanwhile, the American Petroleum Institute reported that the black gold stock increased to 7.83 M barrel in November 2 from previous 5.7 M barrels. Also today all eyes will be on the EIA's Crude inventories which are expected to increase by 2 million barrels. US Crude oil prices reached a 7-month low after reaching the $62 level and breaking it. 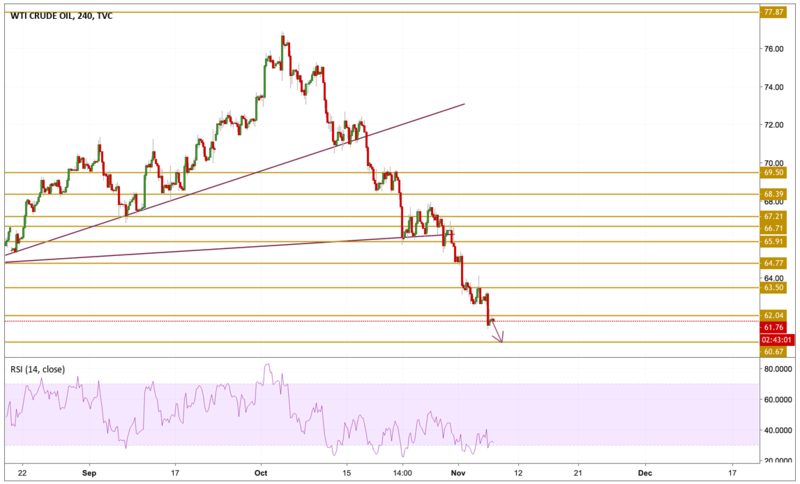 The price is currently hovering just below the $62 support level at $61.7 with a very bearish momentum as we can see on the RSI. There is no sign of reversal so far so we will be focusing on the next support level which is the $60.67 level.